Contributed Photo. The Highlands Bluebirds boys golf team won the Bullitt East Invitational on Friday in its first outing of the season. The Highlands Bluebirds boys golf team found itself facing a force of nature in its first golf tournament of the season. 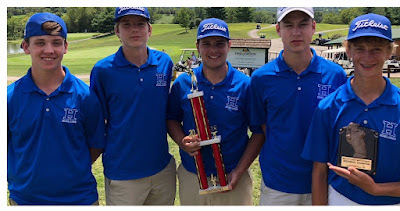 But the Bluebirds overcame it on their way to the Bullitt East Invitational Tournament championship Friday at Tanglewood Golf Course in Taylorsville located southeast of Louisville. Highlands shot a 302 to win the 21-team tournament beating the likes of 2017 state tournament qualifying teams in 2017 8th Region champion Grant County, Owensboro Catholic and LaRue County as well as Estill County, Louisville DuPont Manual, Louisville Eastern and Shelby County. 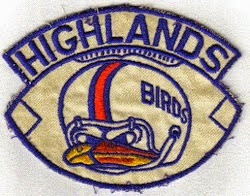 "They did a really good job of showing some mental toughness," said Bert Richey, Highlands Head Coach. "There were a lot of teams that fell apart in the last five or six holes and our kids did a good job of staying composed and not letting their mistakes compound. J.D and Luke played really well. The wind really picked up and started blowing hard. If you didn't hit it solid, it went off-line a lot more than normal." Highlands sophomore J.D. Gabbard won medalist honors for the 18-hole tournament shooting a 71. Fellow sophomore Luke Muller shot a 72 good for second overall in the tournament. "I was hitting all my clubs pretty solid (Friday). I felt confident in all of them," Muller said. "On a couple of the later holes, I felt like I could just really go after the ball because I had the wind at my back. I knew if I hit it up (closer to the hole, the wind) would take it further and have a chance to hit the green for a par four I finished on. Sometimes if (the wind) is in your face, you have to sometimes hit a lower ball (closer to the ground on a line drive) and club up. If it's helping, you have to club down and (use a ) smooth swing with the wind helping. It's just a little bit easier." Seniors Ryan Leigh and Brady Walz finished out the scoring shooting 76 and 83 respectively. Senior Steven Grimme finished right behind Walz at 84. Highlands plays in the Walton-Verona Tournament at Sugar Bay Golf Course in Warsaw on Saturday. Tee time is 1 p.m. after the girls teams finish.